A watch needs to be cleaned and oiled every so often because the oils and greases used to lubricate the moving parts thicken then dry out. Oil or grease that is dried out cannot lubricate the moving surfaces adequately and they wear or, even worse, over time oil can mix with dust from the atmosphere to form a grinding paste that quickly wears parts. Spare parts for old watches are often no longer available, so a worn out part can mean that an old watch cannot be repaired economically. Modern watches with fully sealed waterproof cases can go longer between services than older watches with less well sealed cases. Case joints that are not well sealed allows dust and fluff into the case. Fluff is a nuisance, but dust is worse because it can combine with oil to form a grinding paste that quickly wears components. Old watches with less than fully waterproof cases should be cleaned and oiled every three or four years, more modern watches with fully waterproof cases can go longer, five or six years, or even as much as ten years for watches with co-axial escapements. If you wind up an old watch and it seems to be running OK, bear in mind that although the components inside the watch are very small and consequently delicate. Human muscles, and even a fully wound mainspring, can generate powerful forces that can damage delicate components — see the section below about damaged stem bearings to see the damage that winding a watch everyday can do if this mechanism is not adequately lubricated. Watches will continue to run for a surprisingly long time without being serviced. But by continuing to run a watch that has not been serviced for a long time, you might be building up wear and damage inside the watch that you can't see. This will become apparent when eventually the watch stops, at which point the damage might be so bad that it cannot be repaired. Replacement parts for old watches are usually no longer available. In theory all the parts can be made for a mechanical watch by a skilled watchmaker, but this is expensive and might not be economic. And some parts are easier to make than others - I wouldn't fancy trying to make a balance spring, and these are now getting in short supply for older watches — even stocks of some mainsprings are running down. And I still haven't repaired the damaged stem bearings shown in the section below. I know how to do it in theory; bore out and sleeve. But in practice, accurately boring and sleeving a a bearing in a wristwatch plate a few millimetres thick is not an easy operation without expensive equipment that most watch repairers don't have. Remember that these old watches have survived through many years and events until now, and it is your responsibility to take care of them and make sure you pass them on in good working condition. A mechanical watch that is regularly serviced could still be working just as well in centuries from now as the day it left the factory; you can't say that about electrical or electronic watches. The cases tend to be not very well sealed, especially if they are jointed (hinged), so fluff and dust can get in and mix with the oil form either a sort of gum that can stop the watch working, or worse, a grinding paste that wears the moving parts. The keyless work (the mechanism that winds the watch or sets the hands when you turn the crown) of a hand wound watch takes a lot of stress through being used every day, and can wear badly if not adequately lubricated - see the discussion about this in the section below, and the picture of a badly worn bearing. The first method places the complete movement in the cleaning machine through a wash and two rinses, the second rinse containing a lubricant, and that's it. There are two problems with this method. It seems to me that the cleaning fluid will not be able to clean difficult to reach places such as the jewel holes with the pivots in them, although I understand that the end or cap stones are removed before cleaning. These need to be cleaned thoroughly to remove congealed oil. Perhaps a powerful ultrasonic machine can do this. I am sure that a single, necessarily very fine, lubricant cannot be ideal for all the different duties of each part of the mechanism, from the fast moving but lightly loaded balance staff to the slow moving but heavily loaded keyless work. This method is certainly quick and cheap, but the downside is probably that it needs to be repeated more often than a full strip and oil. Before committing your watch to be serviced it is always best to ask which method will be used, simply for the avoidance of doubt. I once purchased some equipment from a watchmaker who used to work for the principal jewellery retailer of a reasonable sized town and an Omega agent. He told me that he used the first method on Omega watches for many years. I was astonished. There is no doubt that a quick dunk like this will get a watch going, but the lubricant carried in the final rinse has to be very thin because it has to go everywhere in the movement without gumming it up, so it doesn't last very long, and it can't adequately lubricate bearings under heavy load such as in the keyless work for winding and setting. More wristwatches are scrapped because of worn out bearings in the keyless work than due to any other reason - see the section on keyless work below. Stem wound and set watches, that is the type of watch that you wind up by the crown and set the time by pulling crown out away from the case, incorporate a "keyless mechanism". It is called this because you don't need a separate watch key to wind or set the watch, hence the watch is keyless. The most common "shifting sleeve" form of keyless work was invented in 1845 by Adrien Philippe, who later joined the Geneva company of Patek to form Patek Philippe. You can read more about the various forms of keyless work at Keyless Work. The action of turning the crown to wind the the watch or set the time is carried into the mechanism by a metal shaft called the "stem". When you pull the crown out to set the time, the stem is drawn out and the keyless work, a system of levers, disengages the winding mechanism and engages the time setting mechanism. If a watch is manual winding, then it has to be wound every day to keep going. Although the stem winding keyless mechanism is a clever piece of design, the bearings are small and not jewelled. If a watch is not regularly serviced and grease in the stem bearings renewed they can wear heavily. It is not unusual that a watch that otherwise runs perfectly well becomes impossible to repair because of wear in the stem bearings and keyless work, so it pays to be aware of this potential problem. Wear in the stem bearings is the Achilles heel of manually wound watches. Automatic watches that wind themselves as the wearer moves around do not suffer anything like as much from this problem, because the stem is only used occasionally. 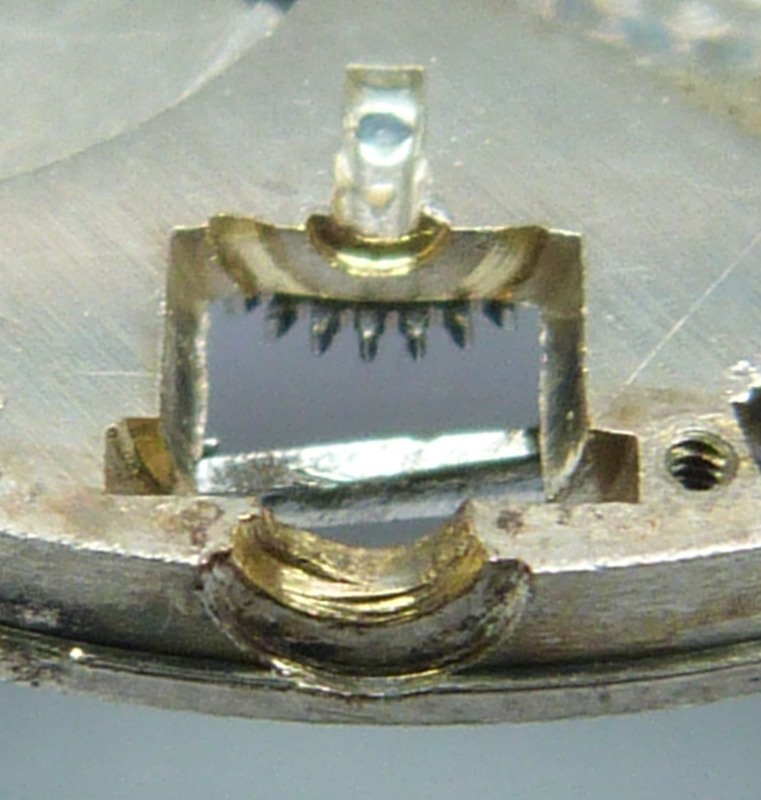 The picture here shows the outer stem bearing in the bottom plate of a watch. It is very badly worn - the tops of the ridges standing up from the bearing surface give an idea of where the original surface was and how much wear has occurred. This degree of wear has almost certainly been caused by the wearer winding his watch while it was still on his wrist. Although it is possible to slide a finger between the crown and your wrist with the watch in place and turn the crown, this picture shows you why this is a very bad idea. Jamming the finger between the wrist and the crown causes excessive side force on the crown and the stem, which has to be carried by this bearing. And as you can see, the bearing is not adequate to withstand this treatment and wears badly. The moral of this is: always take off your watch to wind it, try to avoid sideways force on the crown as far as possible, and also have the watch serviced regularly to get the stem bearings lubricated. If you wait until your watch stops running or you can no longer wind it, it might be too late!